Calderdale Council has recognised the hard work and commitment of its longest serving staff at a special celebration event. 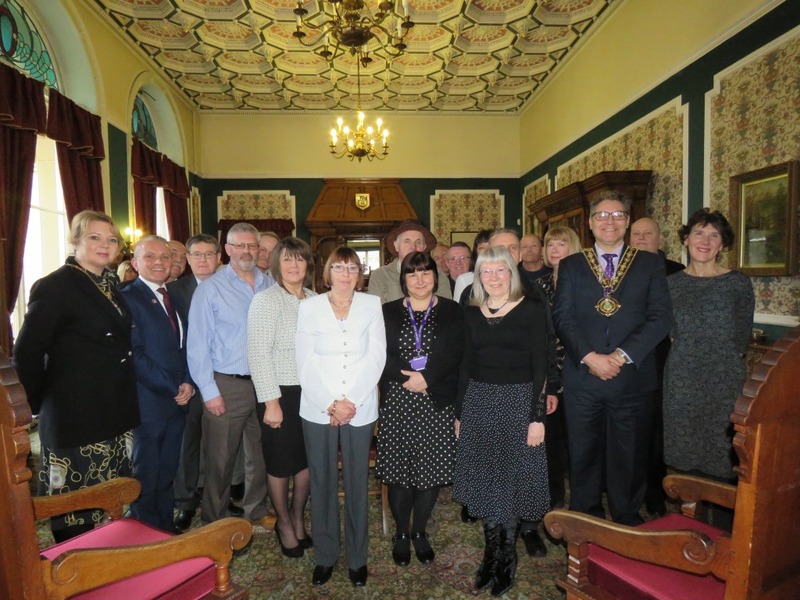 Over 20 members of staff have worked at the Council for more than 40 years. These staff, who work in a variety of roles, were invited to lunch with the Mayor of Calderdale to thank them for their work. Along with the Mayor, staff were joined by the Mayoress, Nicky Chance-Thompson, the Council’s Chief Executive, Robin Tuddenham and Council directors. “It was a privilege to host an event for some of our longest serving members of staff, who, with over 40 years of service each and almost 870 years of service between them, have all made important contributions to communities right across Calderdale. Richard is the Council’s longest serving member of staff, having worked for the authority even before Calderdale Council was established in 1974. Richard started in 1972 as a Foreman Arborist and is currently the Council’s Senior Tree Officer. Throughout his long career he has assisted many residents with advice in relation to tree management particularly with regard to safety issues. Greg commenced his role in 1973 and is the Council’s second longest serving employee with 45 years and 4 months service. Greg worked from Centre Vale Park carrying out maintenance jobs and cutting grass and now cuts grass all around Upper Valley area. Linda is the third longest serving employee at the Council. Linda is a well-known face to visitors of Brighouse Library, where she started working in1974. She’s worked there ever since and also started working at Shelf Library in 2009. Peter started working for Calderdale in 1977. His unusual career path saw him start work at an Assistant Gardener before moving into organising events in the borough as the Events and Licensing Officer. Peter has liaised with hundreds of television production companies assisting with filming requests, including for major recent productions such as Happy Valley, Ackley Bridge and Gentleman Jack. He also made a massive contribution to the biggest event the borough has seen, working on the Tour de France Grand Depart, with over 180,000 spectators watching the race. Ted started working for the Council in 1976 and has made a massive contribution, firstly through his work as Countryside Project Officer at Jerusalem Farm, and more recently as UNISON Branch Secretary. Ted officially retires on 31 March 2019 with just short of 43 years service. Jayne started in 1979 at Elland Swimming Pool as a Lifeguard and then became a Swimming Teacher. Over the years she has taught hundreds of people to swim. She is currently Lifeguard at Brighouse Pool. Karen started working for the Council as a Town Hall receptionist in 1978. She’s since worked as a supervisor in the Council’s post room, and in her time has handled thousands of post items. Karen is now the Senior Admin Manager and responsible for the Council’s current post system. Roberta started in 1978 at Todmorden Library as Junior Library Assistant and is now the Team Leader for West Calderdale libraries, operationally responsible for ten of Calderdale’s libraries. Paul started in 1978 as Payments Clerk and after spells in Internal Audit and Central Accountancy is now Finance Manager for the Chief Executive’s and Regeneration and Strategy directorates at the Council. Janet started in 1978 as a trainee Finance Officer and after working in Social Services payroll became Finance Manager, providing financial support to both the Adults and Children’s directorates at the Council. David started at the Council in 1976 as Audit Assistant and is currently Senior Finance Officer responsible for managing the Council’s investments. Kevin has worked at the Council since 1978. He began as an Assistant Gardener in Calderdale parks. He’s also worked as a Driver and in other gardening roles. He currently works as a Council Craftsperson supporting the mail run, white lining football pitches and grass cutting. Chris started in 1978 as a Junior Assistant Gardener looking after bowling and putting greens across the borough. After being Head Gardener, he is now Driver/Semi Skilled Operative based in Shibden Park where he cuts grass, weeds and carries out general maintenance of the park. Keith started in 1977 as an Assistant Gardener and is currently based at Manor Heath growing bedding plants and producing the lovely hanging baskets for Calderdale. Started in 1977, Philip began his career at Woodhouse Nursery in Brighouse and is now a supervisor at Manor Heath Park in charge of producing floral displays and running the Park and Jungle Experience. Fiona started in 1978 as Shorthand Typist in Crossley House. After spending some time with the Housing Advice Centre is now the Service Desk and Information Officer with the Corporate Asset and Facilities Management team. All Calderdale Council staff are playing an important role in developing and achieving the Vision2024 for Calderdale to be a place where people can reach their potential, where talent and enterprise can thrive, where people care for each other and are able to recover from setbacks, and a place that stands out as a great destination to visit and where people can live a larger life.